Lovely early morning with the loons | Vermont Paddle Pups! We headed out early to a quiet lake…saw quite few loons and ducks. There are many marked nesting areas, so it won’t be long before we see the baby loons! We stopped for breakfast at a day use pull-out, and Griff slipped at he dis-embarked the canoe. The foam pad slipped again as he jumped back into the canoe; apparently we had the perfect combination of amount of water, temperature, and location of the foam pad needed to cause this sliding. We plan on getting some bathtub non-slip strips to put in the base of the canoe, under the pads, to keep them more stable. 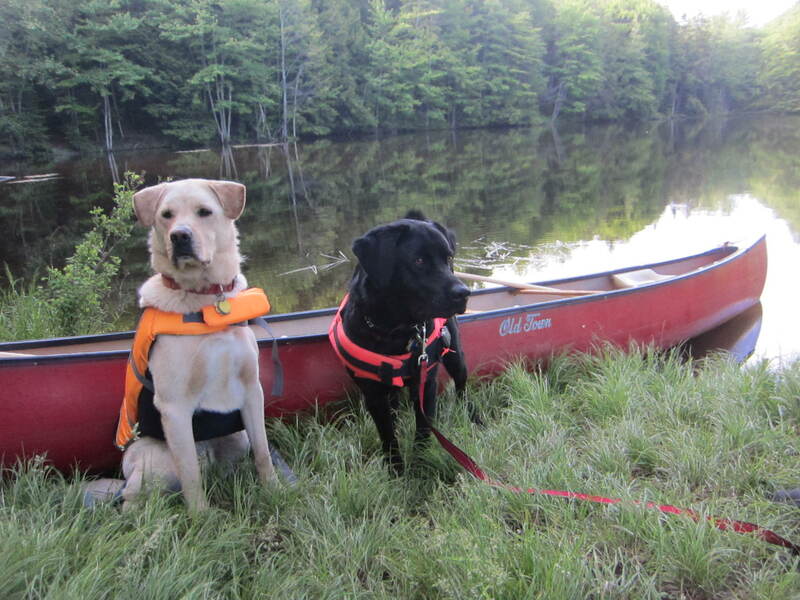 We also selected the campsite for our next canoe camping adventure, and made the reservation….this is remote canoe camping, so we’ll have to see how much gear we can safely bring along this year, now having two dogs in the boat. Waiting at the breakfast site…. ← Great progress on Father’s Day!